One of the most expensive components of a campaign is direct mail. Sure, digital media has become all the rage in both the corporate and political advertising worlds, but mail is still king. Indeed, some studies indicate that direct mail is “the most popular tactic” with 96 percent of consultants indicating their local candidates use it (Strachan, 2003, 25). And the reason direct mail reigns supreme is because it works. Direct mail is effective at reaching, persuading and mobilizing voters like no other medium to date. Some have argued, as Victoria Belknap did in an “advertorial” on October 20, posted on the Campaigns & Elections website, that the US Postal Service’s Every Door Direct Mail® (EDDM®) is the way to go for smaller campaigns on a budget. The argument is that the expense of direct mail comes from “design…mailing lists, permits, and the standard postage rates associated with traditional direct mail,” and that EDDM® can help save campaigns money. Can EDDM® save campaigns some money? Perhaps. But when campaigns and consultants evaluate their budget and how to save money on their mail, they have to take into account more than just the few pennies saved. They must also gauge the effectiveness of the mail, the continuity of their message and the quality of service they receive. The problem with the argument in favor of EEDM® is that using EDDM® and EDDM® vendors removes all of these critical elements that make traditional direct mail programs effective. In total, EDDM®, in my estimation, provides a much lower return on investment than traditional direct mail. The first, and most critical, downfall of EDDM® is that it is void of many requisites of a successful mail program, including voter targeting and motivating design elements. While a high quality mail list may be considered expensive, they are the foundation of an effective direct mail program for several reasons. First and foremost, a mail list provides campaigns and consultants with a list of registered voters. Second, consultants can segment lists by a voter’s history. Third, a mail list is multi-functional, serving as the same list for grassroots operations. EDDM®, by definition, goes to every door. With EDDM®, campaigns can choose which areas they want to cover by selecting carrier routes, but that is a strategically insufficient method of targeting on a budget. By using EDDM®, campaigns are wasting valuable resources by contacting not only residences where no one votes but also businesses and empty houses along a carrier route. When soliciting votes, campaigns must reach voters. Indeed, Shea and Burton (2006) cite the “precision” of direct mail as one of primary reasons it is “a powerful weapon” (189). EDDM® does not offer the precise targeting necessary to realize the full power of direct mail. Another thing EDDM® vendors do not give campaigns is compelling design. In the direct mail industry, we understand we have from the mailbox to the trashcan to communicate our message to the voter. We must do so through brief, succinct copy coupled with intriguing design that complements the message and drives it home. My mantra is “Unless you’re running for town baker, leave the cookie cutters out of politics.” EDDM® shops offer campaigns designs that are cliché at best and uninspiring at worst. Their VistaPrint approach to political direct mail offers no uniqueness or ability to drive the message with visuals. As an aside, the designs I have seen on EDDM® vendor websites contain no place for disclaimers (paid-for lines), which could run a campaign afoul of ethical and legal requirements, costing them more in the long run than they saved by going with an EDDM® vendor template. Another perk of using a traditional direct mail consultant that is not feasible with EDDM® vendors is the stability across different advertising media. Because EDDM® vendors offer template mail pieces, the design elements and assets are locked into place. As important as direct mail is to a campaign, the direct mail plan is not executed in a tactical vacuum. It must go hand-in-hand with advertising and voter contact in other mediums including push cards, door hangers, television spots and newspaper ads, the latter of which is used heavily in small, local races — precisely the kind of campaign EDDM® vendors are targeting with their efforts. Traditional consultants who use in-house designers are best equipped to offer the continuity of design to campaigns because the consultant and designer are working from the same design elements and assets for all advertising. This prevents the campaign from having to reinvent the wheel on new advertising, saving precious campaign dollars in the long run. Politics is about people. And it’s not just the candidate shaking hands and kissing babies. It’s also about the rapport that is built between political professionals and their clients. When a candidate calls a traditional direct mail consultant, the firm knows the candidate, and the candidate’s wife, and the campaign manager, and the candidate’s dog. Consultants take the time to get to know their clients, and with that knowledge comes personal — and personalized — service. Personalized service is primarily about the person-to-person relationship; it’s about knowing the client. But there is more to it than that. If a client doesn’t like a font or color on a mail piece, traditional direct mail consultants can (and will) change it for them. All it takes is a phone call. EDDM® vendors on the other hand cannot offer that level of personalized service. Sure, you can probably call their customer service hotline and ask, but you’re locked in to the design, bad fonts and all. Campaigns must operate on a budget, and the budget for smaller races is understandably smaller. But smaller budgets do not mean the candidate’s tactics must suffer because of it. 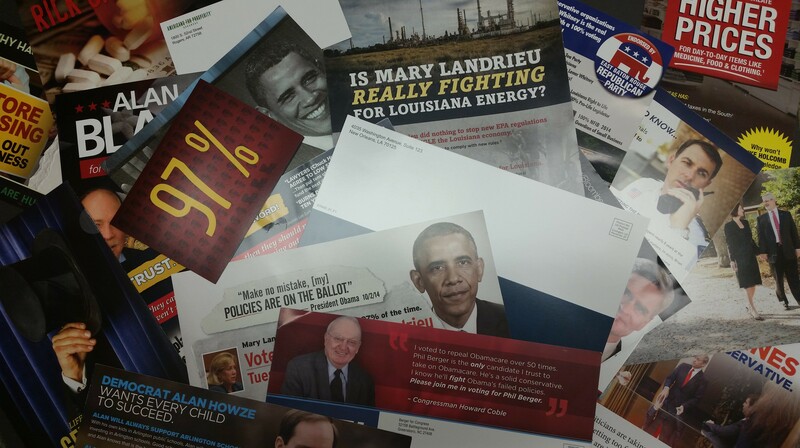 Too much is at stake in elections for subpar work, particularly when it comes to direct mail. With the rise of consultant-centered campaigns and with the expansion of the consultancy to local races, candidates are not at a loss for a consultant who meets their needs and budget. Every Door Direct Mail® from the postal service and the EDDM® approved vendors do not offer what candidates deserve from their consultants: professional service, personalized attention and direct mail that moves the needle.